View larger image This picture was sent to me in September, 2006 by a gentleman in Buenos Aires, Argentina - Juan Ramón Mantilla. According to Juan, the scow, named "El Pato" (The Duck) was built around 1906/07. In this photo, dated 1908, the scow is sailing on the Rio de la Plata in Tigre, a province of Buenos Aires, about 30 kilometers north from Buenos Aires. Juan's grandfather is steering the boat. El Pato was built by two brothers, Jorge and Eduardo Newbery, who, along with Juan's grandfather, belonged to the Buenos Aires Rowing Club in Tigre. 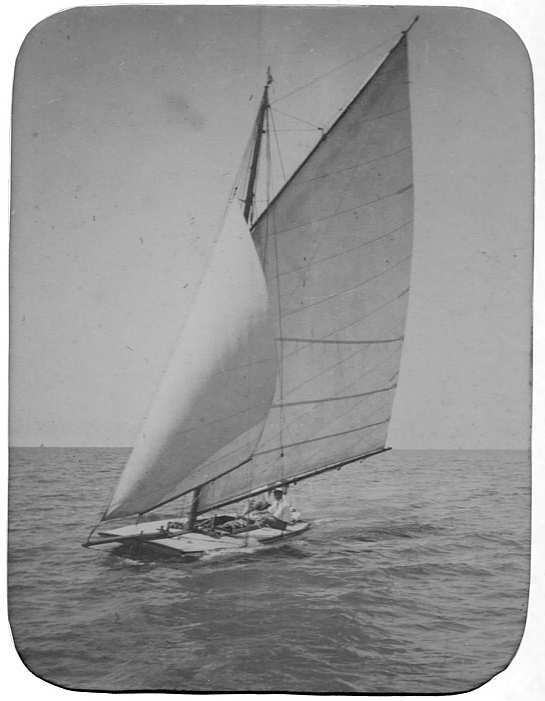 The Newbery brothers brought a scow, which was named El Tortuga (The Turtle), back to Argentina from the US. It had a rounded bow. They built El Pato (with its square bow) in the garage of Eduardo's house. When they had to take it out, it was necessary to break down a wall to do so. Note the similarities of this boat to the St. Michael's scow. They would appear to be close to the same size (possibly a bit larger). 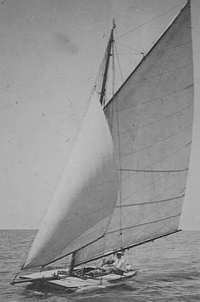 However, unlike the simple Marconi rig of the St. Michael's scow, El Pato sports a gaff-rigged main, necessitating beefier and more complex rigging. And, of course, this scow predates the St. Michael's scow by at least 20 years. One can only guess when the first scow of this type may have been built. Although the air may have been fairly light on the day this photo was taken, it still shows just how stable these boats must have been. The large, probably heavy, sails are full and drawing well and the captain is sitting on the leeward side, yet the boat is hardly heeled over at all. The Newbery brothers were fascinating characters - best known as aviators. An interesting article about them is available on Wikipedia. Many thanks to Juan who was kind enough to contact me, send me the photo and history of the boat, and give me permission to use in on my web site! It's a delightful image.